For Rebecca Brouwer, starting a small sheep farm in western Loudoun is a dream come true. And she wants to share the experience of farm life, along with the fruits of her labor, with holiday shoppers. Brouwer makes patterned scarves, wraps, Christmas stockings and ornaments using a special technique that combines felted wool with recycled fabrics. Wool products are hot for shoppers looking for Loudoun-made gifts this season. Brouwer and fellow members of the Loudoun Valley Sheep Producers Association will be at the Leesburg Farmers Market Saturday, Dec. 15 for their annual pop-up holiday market. Rebecca Brouwer displays her Christmas stockings that she makes using a special blend of felted wool garnered from her Gotland sheep. She and her husband raise sheep on their farm, Shepherds Corner, near Purcellville. Brouwer grew up on a farm in Minnesota and describes her childhood as something close to the character Fern from E.B. White’s iconic “Charlotte’s Web.” She spent decades moving around the country for her husband’s Navy and corporate careers but always wanted to get back to her rural routes. So, when she and her husband, Dennis, had a chance to settle down on a farm in Loudoun, they took it. 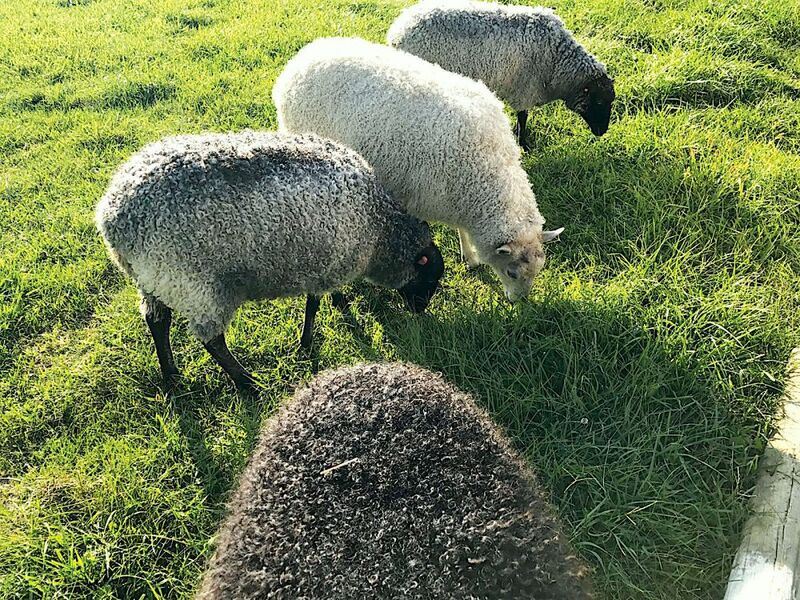 The Brouwers bought the farm they named Shepherds Corner in 2000 and in 2015 bought their first Gotland sheep, chosen for their gorgeous gray wool and sweet dispositions. They now have 21 sheep, and Brouwer was delighted to welcome her first homegrown lambs this year. Brouwer is also a longtime sewing and crafting enthusiast and this year decided to start selling her felted wool products from her farm boutique set up in a renovated log cabin on the property. Rather than sending her wool out to be made into yarn, Brouwer uses felted wool as her medium of choice, carding, batting and felting the wool and combining it with patterned fabrics to make small crafts as well as larger wearable pieces like scarves, wraps and Christmas stockings. 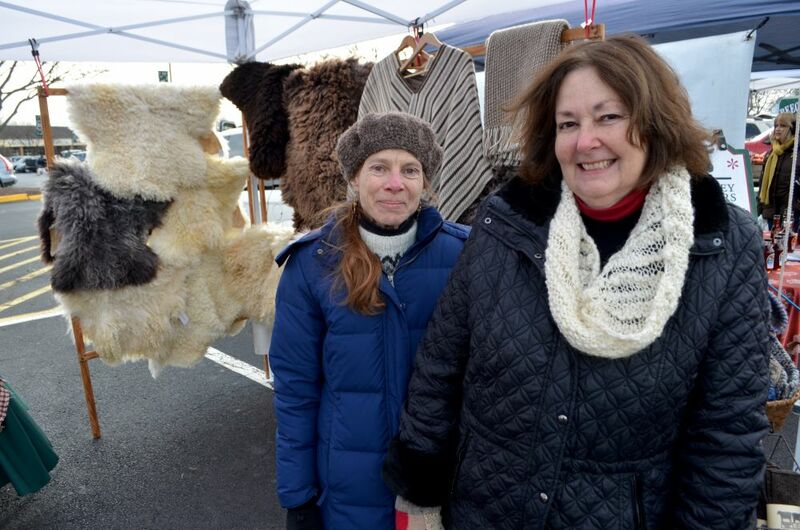 Lynne Updegrove, left, and Kathy Reynolds display their sheep pelts at the Leesburg Farmers Market. The pelts are gifted as a soft, warm surface for babies, car seat warmers and rugs. For LVSPA board member Lynne Updegrove, who raises heritage breed Cotswold sheep on her farm near Lincoln, wool products are ideal holiday gifts, offering warm items for chilly days. 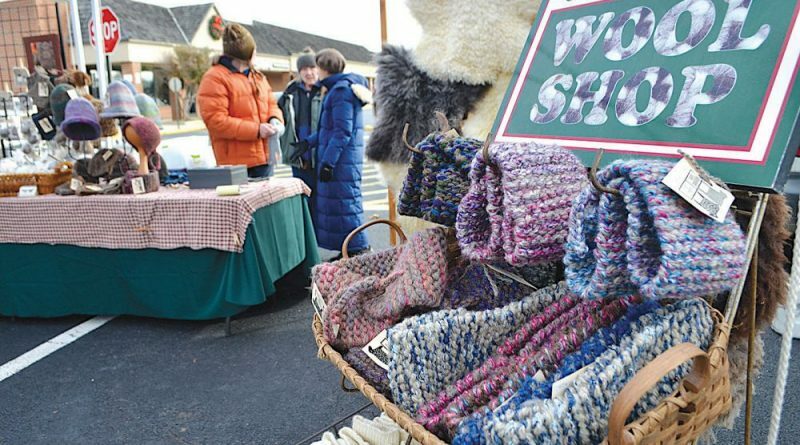 Decorative items—like crafts and ornaments—or wearable felted pieces—such as hats, gloves, socks and scarfs are popular items at the holiday market. Sheep pelts are also increasingly in demand, Updegrove says, and are gifted as a soft, warm surface for babies, car seat warmers and rugs. “People are more in tune to things that are local and local farms. There’s certainly a group that’s trying to seek out local items,” Updegrove said, adding that as the LVSPA goes into its sixth holiday market, return customers now seek them out every year for gifts. 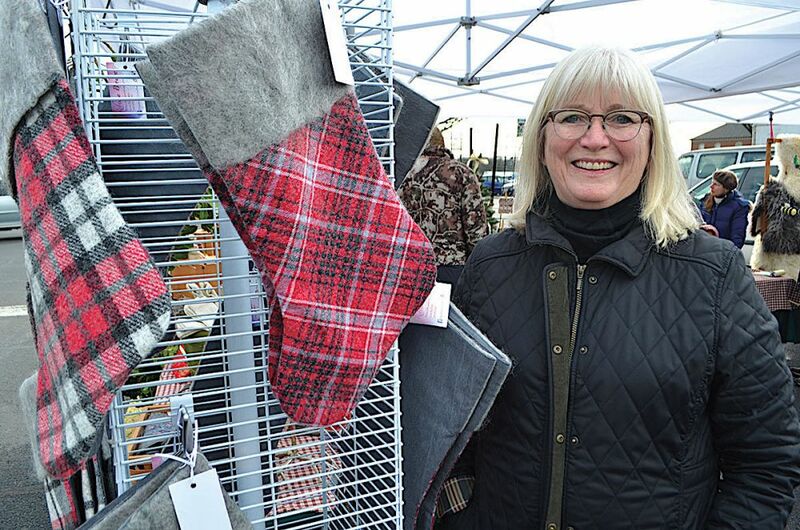 The sheep and wool holiday market is coordinated by one of grande dames of Loudoun’s sheep and wool scene, LVSPA founding member Linda Landreth who has a flock of more than 40 sheep behind the Waterford Market which she operates. Landreth sells lovely and functional hats, socks and other products at her store year-round and will be on hand at the Leesburg event. One of Landreth’s most popular items for the holidays is her wool dryer balls, which sell for around $10 each and are a perfect stocking stuffer. The balls reduce static and shorten drying time without the chemicals found in dryer sheets. “They’re unbelievably efficient, and they last forever,” Landreth said. Brouwer, a relatively new LVSPA member, will also be at the Leesburg market Dec. 15, while Dennis holds down the fort at her farm boutique, which will also be open Dec. 22 and 23 for last-minute gifts. For now, Brouwer has declined to open an online store and instead encourages shoppers to visit the farm, which is included on the Holidays in the Loudoun Valleys tour as well as Loudoun’s Artisan Trail launched earlier this year. The Loudoun Valley Sheep Producers Association holiday market at the Leesburg Farmers Market is 9 a.m.-noon Saturday, Dec. 15. Find details at loudounfarmersmarkets.orgor lvspa.org. The Shepherds Corner Farm Christmas Boutique is open 10 a.m.-4 p.m. Saturdays and noon-4 p.m. Sundays through Dec. 23. Learn more at she.farm. The Waterford Market is open 10 a.m.-7 p.m. Monday through Friday and 10 a.m.-5 p.m. Saturday. Find details at waterfordconnection.com/waterford-market. Rebecca Brouwer’s Gotland sheep roam on her farm, Shepherds Corner, near Purcellville. She chose to raise Gotland sheep for their beautiful gray wool.